On August 18, I turned the ripe old age of 26. For my birthday, I went out with my family to Jimmy’s in Arlington, a favorite restaurant of mine. I had a nice chicken parm dinner with linguini and bread with a side order of salad with blue cheese. The following weekend, I hung out with my brother, Brian and his friends Phil Gustin, Rich Kei, and Amanda Smith at Tia’s in Boston. The next day was even more exciting, I saw many of my relatives at my cottage in Marshfield and received wonderful gifts from them. My aunt Noreen gave me a delicious Reese’s cake for a treat and Sheila and her family made Rice Krispie treats with vanilla ice cream and caramel in it. Both on the beach and later in the evening, I hung out with my friend Caitlyn DiSanto and her friends from Burlington and college. I gave Caitlyn and her friends copies of the Arc’s newsletter that featured my poem about All Aboard The Arc! back in May. Through Caitlyn, I made some new friends throughout the course of the day in Marshfield and hope to see them again this fall. This past weekend, I went with my parents to NYC for a weekend trip as part of celebrating my parents’ upcoming 30th wedding anniversary. It also did feel like an extended birthday present for me. We stayed at the Dream Hotel in Midtown Manhattan on the 10th floor. During the weekend, we visited many sites throughout this great city and I felt a strong desire to visit as many places as I could in NYC. I would also check out various interesting restaurants and culinary flavors the city has to offer. 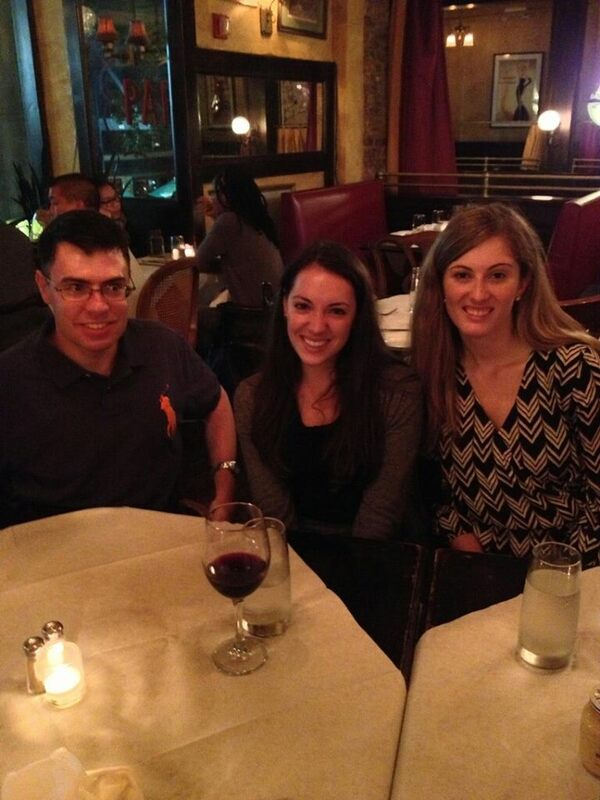 On Friday evening, I would catch up with my cousin Catie and her friend Jackie at a bistro called Papillon. There, I told Catie about how my birthday went, how my family members (immediate and extended) and friends have been doing lately, and we even had a lengthy conversation about our personal celebrity encounters in life. I had seen Harry Smith of NBC News, formerly of CBS News, on his way to a bank machine in the NBC Studios building, since earlier I was on a tour to see the skyline of the city from the top of Rockefeller Plaza. Saturday was perhaps the most eventful day of the trip. 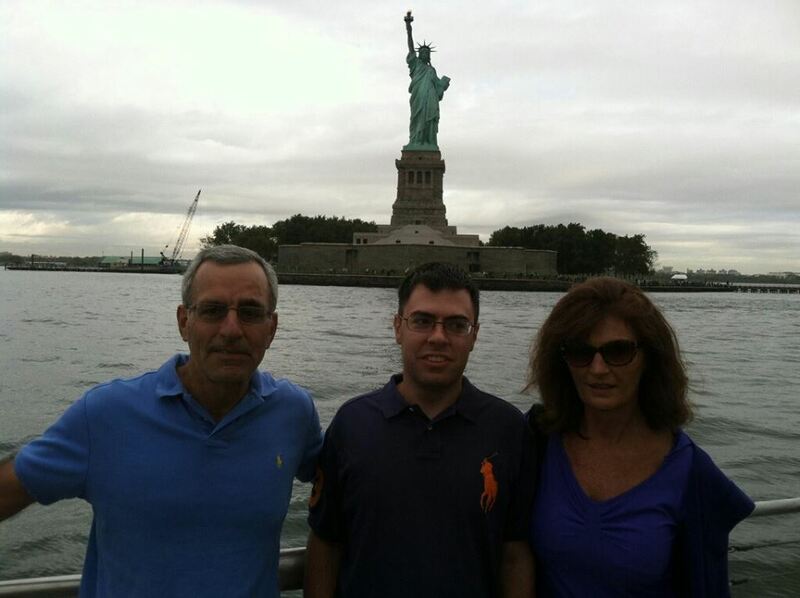 That morning, my parents and I did a boat taxi ride tour to see the Statue of Liberty. Seeing Statue of Liberty was truly exhilarating since I got a great view of the Statue from the boat and this experience was made memorable with Frank Sinatra’s “Theme from New York, New York” playing in the background. I made sure to get a memorable photo of the Statue with me and my parents. Later on that day, I would go to such places as the 9/11 Memorial, Tribeca (where Robert De Niro has his film festival), Greenwich Village (near where Catie lives and the folk and bohemian capital of the city), Little Italy (where I ate pizza and tried a new sweet treat called a cronut, a mix of croissant and donut), Carnegie Deli (where I had a great pastrami reuben that was extremely filling), and finally to conclude the evening, my parents and I enjoyed a nice rooftop view of the city, including Times Square, from the top of the hotel. Sunday morning and afternoon was the final day for us in the city. The main highlight of the day was going to a tour of NBC Studios in Rockefeller Plaza. The pages showed us the sets of Nightly News with Brian Williams, the news operation room, SNL, Late Night with Jimmy Fallon, and Football Night in America. I had noticed that one of the pages had an Autism Speaks puzzle piece pin and told her about my experiences on the autism spectrum and my poems about autism. The page encouraged me to send my poems about autism to the crew at Late Night with Jimmy Fallon to help gain more exposure about the message of autism through poetry. Finally, at the end of the day in NYC, I enjoyed nice two slices of pizza from Famous Original Ray’s Pizza, located near the Dream Hotel. NYC has so many pizza places named Ray’s that it was difficult to keep track of all the locations. I hope to come back to this city in the next few years and also hope to visit cities and places like London, Chicago, LA, San Diego, Montreal, Vancouver, Ireland, Toronto, Italy, Seattle, Paris, and Texas.